TAG Heuer Men’s CV2A12.FC6236 Carrera Day Date Automatic Chronograph Watch: With a rich brown face and luminescent hands, this watch is as precocious as it is precise. 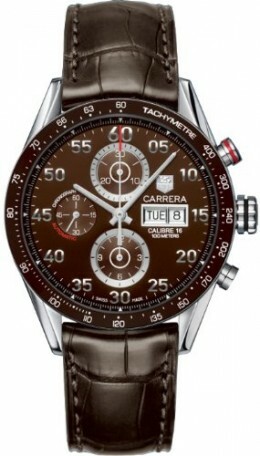 It is water-resistant up to 300 feet and displays the day and date with self-winding automatic movement. The brown alligator strap is 7″ and fully adjustable. Its brilliant detail is fluid and uniquely fashionable. The TAG Heuer Men’s Carrera Day Date Automatic Chronograph Watch features a deep brown dial and matching brown alligator leather strap. Scratch-resistant sapphire crystal covers the watch face which displays the day and date, chronograph features and luminescent hands and minute markers. The 7″ fully-adjustable strap includes a deployment buckle to keep it securely in place. The polished steel case features a sapphire crystal exhibition back, and the self-winding automatic movement offers convenience. This watch is water resistant up to 300 feet and exudes upper class and luxurious appeal.